Can Cue Card and Silviniaco Conti recapture former glories? When it comes to surprises, probably two of the biggest of the jumps season so far surround the defeats of Grade 1 chasers Silviniaco Conti and Cue Card. With sparkling entries in the formbook and consequentially big followings, the pair were expected if not to win then to, as they say, 'go close' as their campaigns left the starting gate in recent weeks. Things have not, however, go quite according to plan. In the Charlie Hall Chase at Wetherby, the Paul Nicholls-trained Silviniaco Conti, successful in last year's King George VI Chase and in a valuable prize at Aintree in the spring, ended up fifth. Meanwhile at Exeter, Cue Card, runner-up in the King George but previously winner of the Betfair Chase at Haydock - beating Silviniaco Conti into third - returned from a long, pelvic injury-induced absence with a fairly well-beaten fourth place in the Haldon Gold Cup. Although it would be quite wrong to suggest either bandwagon had lost a wheel, both suffered wobbles, so will be hoping for a return to the straight and narrow in this year's Betfair Chase. 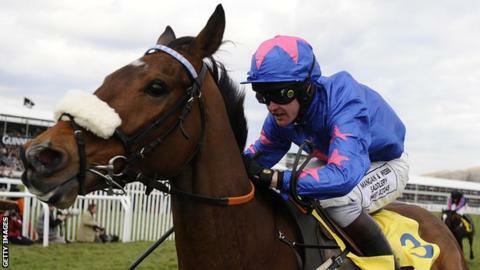 Despite those reversals, Cue Card - now the mount of Daryl Jacob after regular rider Joe Tizzard, son of the horse's trainer Colin, retired - and Silviniaco Conti (Noel Fehily) head the field for Saturday's Haydock feature. Other hopefuls include the David Pipe-trained Dynaste, winner of the Ryanair Chase and runner-up behind Cue Card here in 2013, plus Menorah, Taquin Du Seuil, Double Ross and Medermit, the quartet in front of Silviniaco Conti at Wetherby. If it sounds like the latest meeting between old friends, all of which have held bragging rights at some point, that's a fair analysis. Obviously, there are other serious big-race contenders staying at home - such as Gold Cup hero Lord Windermere, that race's former winner Bobs Worth, rising Irish star Champagne Fever and the hugely exciting Simonsig - but, even so, this division looks pretty open. Paul Nicholls, whose other King George possible Al Ferof has his first run of the season in Ascot's Amlin 1965 Chase, said: "Maybe there's no superstar amongst them at the moment, and the Betfair looks like a good race which three or four horses could win, very open. "The race [at Wetherby] will have done Silviniaco the world of good - he needed to have a race before Haydock - and he's really fit and well, and we're looking forward to getting back." Of the highly rated Al Ferof, fifth behind Dynaste at the Cheltenham Festival, the champion trainer added: "He's not run since Cheltenham in March, but there haven't been any problems - he goes well fresh. "The plan is to go from Ascot to the King George, where he was third last year on ground that was too soft, and then he could go straight to the Gold Cup - I feel he'll get the three-and-a-quarter miles on good ground." Just as the Nicholls camp is bullish about Silviniaco Conti's Haydock prospects, the same can be said about those around Cue Card. "Exeter has sharpened him up for the Betfair," said Colin Tizzard. "He ran very similar in the Haldon Gold Cup as he did last year [when third] and is at the top of his game." The leading chasers are not the only stars on show at the Merseyside track as Champion Hurdle third The New One, trained by Nigel Twiston-Davies, lines up in the brand new Betfair Price Rush Hurdle. The ratings and formbook suggest the six-year-old, who remains the mount of the trainer's jockey son Sam despite him now working for Nicholls, will comfortably see off his rivals.